Do you want to excel at the village show or just have the vest best in your own garden? Dobies experts have worked with top sweet pea breeders to bring you a blen of the best varieties for flower colour, size and form - so important to the judges. Scent Key - 3 (high scent). Height 1.8m (6'). Easy to grow. HA - Hardy annual. Tall growing variety - supports will be required in the form of trellis, sticks, canes or wire netting. 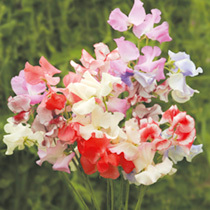 A stunning addition to any garden, sweet pea flowers demand to be picked - and with so many having such a sweet scent who could resist?